One day a week, Kyle, a fourth grade student, leaves his school uniform at home. Instead, he dons a gray Robotics and Coding Academy T-shirt, printed with colorful cartoon robots. It might be his favorite day of the week. 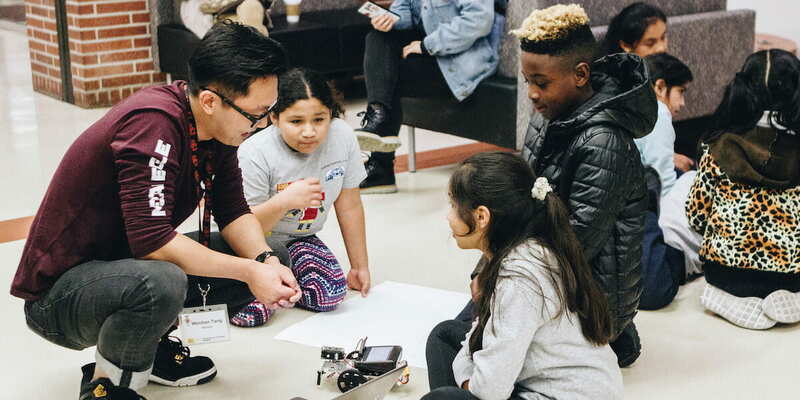 On Dec. 3, 2018, Kyle joined over 70 local elementary students in USC’s Seeley G. Mudd Auditorium to show parents and families the robots they spent the fall programming. It was the bi-annual competition for the Robotics and Coding Academy, a USC Viterbi-sponsored STEM program that inspires area children to pursue careers in science, technology, engineering, and mathematics. The final challenge: see which team’s robot can best trace the shape of a star. “I like it because it’s fun to do, and I like electronics. My favorite part is building cool stuff and getting to control it,” Kyle said with a grin. RCA is an afterschool program that takes place once a week. During each 90-minute session, 15 undergraduate and graduate USC students mentor young students in the fundamentals of computer science and coding using robots. Because of the small size of the groups, every student has a chance to get involved. They also have hands-on experiences with technology, working with Mac laptops, programming the movements of the robots, and learning the basics of different websites. “The best way to change students’ computer literacy is to start early,” said Gigi Ragusa, program director and USC Viterbi professor of engineering practice, who trains the USC students on the lessons they’ll teach each week. John Purcell, a first-grade teacher who serves as the teacher liaison for 32nd Street Magnet School, was impressed with the program and USC’s commitment. Teachers choose the students for the program based on their interest and ability to commit. There is an equal number of boys and girls. Many of the young participants are Latino or African-American, underrepresented groups in STEM fields. For many of these students, their once a week meeting isn’t enough. “I’ve actually had kids that ask for homework, so they can continue to code and learn at home,” Ragusa said. Held at three local elementary schools surrounding USC, the RCA program runs for 13 weeks in the fall and 13 weeks in the spring. The schools include: USC’s 32nd Street Magnet School; Foshay Learning Center; and the Theodore Alexander Science Center School. Participating students are in third, fourth and fifth grade. Ragusa was involved in RCA from the start, but she became the director in 2015, when the program was only one year old. Since then, the program has changed and improved, evolving from students learning basic drag and drop computer programming to the more complex and applicable C programming language. This spring, the robotics and coding academy will add a new focus on cyber security. “Now that students know what’s going on behind certain websites, they need to be aware of Internet safety and the importance of privacy,” Ragusa said. Students learn coding by inputting computer commands that direct real-life robots. “We chose to add the element of robots to the program because it really is a great way to get this age group excited about coding,” Ragusa said. “They get to personalize and decorate their bot, they get to teach it to dance and most importantly, they get to learn something and then see it visually applied. “It’s so fun for them, they don’t even realize they’re learning!” she added. The Robotics and Coding Academy is partially funded by Good Neighbors, a USC-sponsored program that supports the local communities surrounding USC. Its goal: enhance education, safety, career awareness, welfare and quality of life in area neighborhoods surrounding campus. However, according to Ragusa, without the additional support of philanthropists such as Satish Nandapurkar, RCA would not be what it is today. Satish, founding partner of a financial risk management firm, and his wife, Marina, gave a major gift to the program last year. “We wanted to contribute to something that would make a difference for kids that might not be exposed to how fun STEM and robotics can be at a young age,” said Satish Nandapurkar, a passionate believer in the importance of STEM education for all children. That Satish and Marina’s son, Zach Nandapurkar, CS ’18, received a full-tuition scholarship as a USC Trustee Scholar motivated them to give back to Troy. Satish Nandapurkar’s parents were Indian immigrants who instilled in him the importance of education, especially in math and science. “Careers in STEM can be a big game-changer economically and for many of these kids coming from underprivileged backgrounds, developing an interest in STEM can be huge,” he said. The Nandapurkars’ gift has changed the program immensely, allowing more robots to be purchased and more USC students to become mentors. That has allowed students in the RCA program to have more opportunities to get hands-on experience with the bots. “Without the support of Satish, the program would not be the same, and everyone here is so grateful for his gift,” Ragusa said. Back at the bi-annual RCA event, students happily enjoyed slices of cheese pizza while they chattered with excitement about the performance of their robots. Proud parents snapped pictures and cheered as they watched their child’s robot follow the lines and angles of a cut-out star on the ground. Some lucky students even walked away with robots that they took home as prizes. In just a few short years, the Robotics and Coding Academy has already had a tremendous impact on the communities surrounding USC, said Purcell, the first-grade teacher.